Tremblers are a New World group of passerine birds related to mockingbirds and New World catbirds. Like these, they are in the Mimidae family. 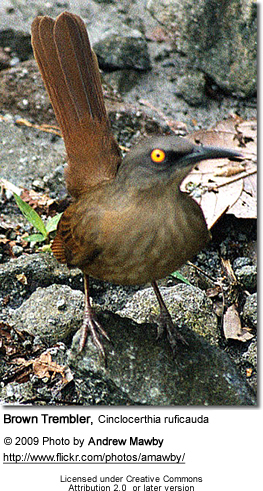 Grey or Martinique Trembler, Cinclocerthia gutturalis : The Grey Trembler is found only in Martinique and Saint Lucia. 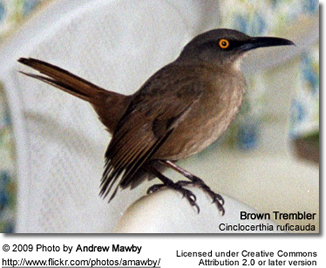 Among the living birds, these are apparently most closely related to the Pearly-eyed Thrasher (Hunt et al. 2001, Barber et al. 2004). Their common name comes from their peculiar behavior: if excited, they will show a much more exaggerated version of the wing-flicking also seen in other mimids, for example the Northern Mockingbirds. The tremblers do not just flick their wings, but shake their entire bodies in a trembling motion.